Actions By 'T' shall not be responsible for injury, death or damage to property resulting from the intentional or accidental discharge of customer's firearm. We will guarantee our work as long as you own the gun under normal wear of parts providing that no one else works on or replaces parts. Any one else working on our handguns voids our guarantee. Reliability can only be guaranteed with American Factory Ammunition. NO RELOADED AMMUNITION. No FFL dealer is required for you to ship your handgun to us via UPS or FedEx. We usually ship FedEx. ALL HANDGUNS MUST BE SHIPPED OVERNIGHT. You can use our FFL number which is FFL No. 5-76-157-01-9H-92289. Customer is responsible for payment of return shipment. Return shipment cost average between $70.00 - $85.00 depending on location and how much insurance is added. For return a receipt card add $1.50. Guns shipped with green cash are given priority. Guns shipped with a check or money order will receive turnaround dependent on work load. 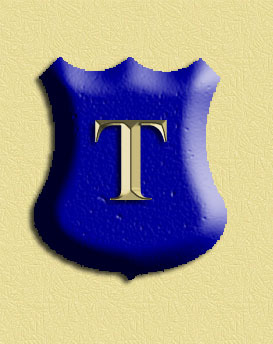 Mailing label on box to be addressed to Teddy Jacobson - for security purposes, not Actions By "T". UPS requires a corrugated box, no brown paper. Letters of instruction must be clear with a return street address, no P.O.B. and a day and evening phone number. Make all checks or money orders payable to Teddy Jacobson and enclose it inside the box. Do not tape letter to outside of box. Guns shipped with personal checks will be held until the checks clear. It is unlawful to ship ammo with the guns. Print address and phone numbers very clear. Guns can not be shipped to a third party unless they are an FFL dealer and we have a signed copy of their license. ANY GUN NOT PICKED UP WITHIN 30 DAYS OF DATE ON INVOICE (DATE STARTS WHEN GUN IS FINISHED AND CUSTOMER IS NOTIFIED), SHALL BECOME THE PROPERTY OF ACTIONS BY "T" AND SOLD TO PAY FOR SERVICES. NO GUN WILL BE SHIPPED WITH A BALANCE DUE. WHEN WE RECEIVE THE BALANCE, YOUR GUN WILL BE SHIPPED. WHEN LOCAL GUNS ARE NOT PICKED UP IN A REASONABLE AMOUNT OF TIME, A STORAGE FEE OF $25.00 PER WEEK WILL BE ADDED TO THE BILL (CUSTOMER WILL BE NOTIFIED). 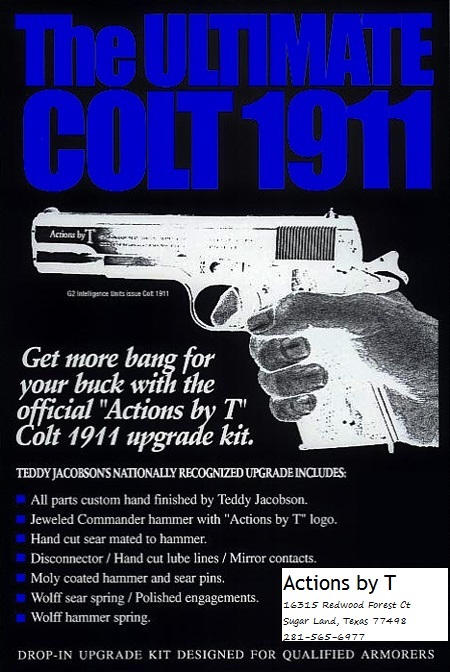 A 1911 upgrade kit is available upon request. LOGO AVAILABLE UPON REQUEST/NO CHARGE PROVIDING NO ONE ELSE HAS WORKED ON THE HANDGUN. LOGO IS ONLY AVAILABLE WITH ACTION WORK ON STEEL.